The Adeii Eichii Cliffs are about ten miles east of Cameron, AZ and run in a north/south direction for nearly thirty miles. The southern end of the Adeii Eichii Cliffs is also known as the Red Rock Cliffs. The area below the Adeii Eichii Cliffs to the west is called Ward Terrace, this is the area of photographic interest. 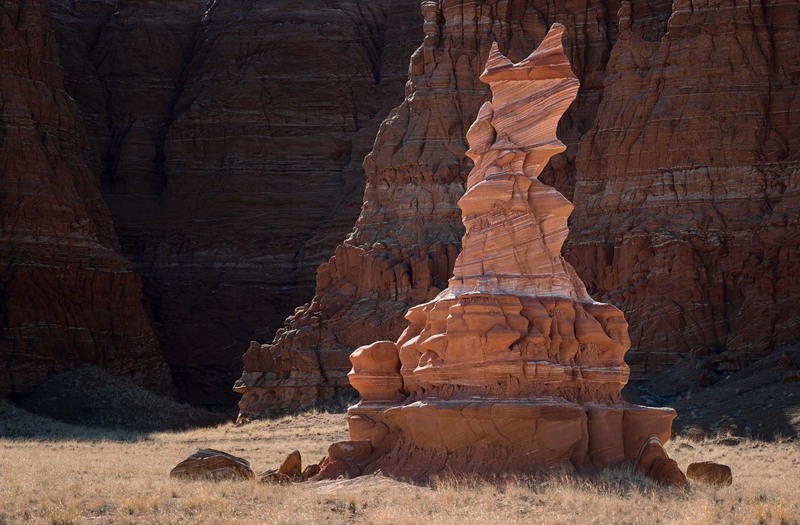 Ward Terrace contains many red and white striped hoodoos similar to those in Blue Canyon. 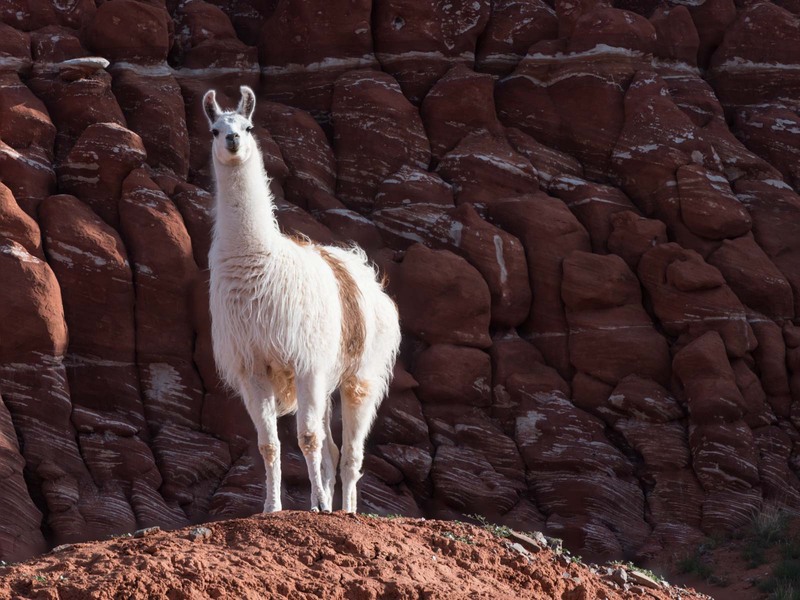 The Adeii Eichii Cliffs are in the Navajo Nation and a permit is needed to visit them. The permit can be obtained in Cameron at the Cameron Visitor Center located at the intersection of Highways 89 and 64 (SW corner). The visitor center is open five days a week from 8AM to 5:30 PM during the winter months. It is usually open seven days a week during the summer but the schedule varies. If you plan to pick up a permit on the weekend during the summer you should call +1 928 679-2303 to get their summer hours. Permits are also available by mail, apply well in advance of your trip date. 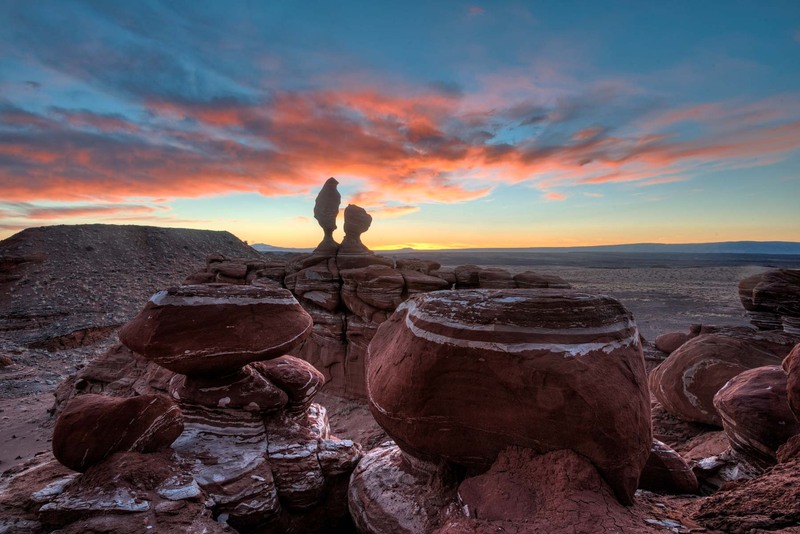 See the Navajo Nation Parks website for more details. Permits are $12.00 US per person per 24 hour period. Camping at the trailhead is included in the $12 pp fee since the permit is valid for 24 hours. The Adeii Eichii Cliffs area is rarely visited. On my first visit I found no evidence that someone had driven there in the past several months and there were no directions to the area on English language websites. On my last visit I saw some tracks in The Ducks area, and travel directions are now available in Laurent Martres excellent book' "Photographing the Southwest Volume 2 - Arizona, 3rd edition". There have been encounters in the past with local leaseholders in the area. 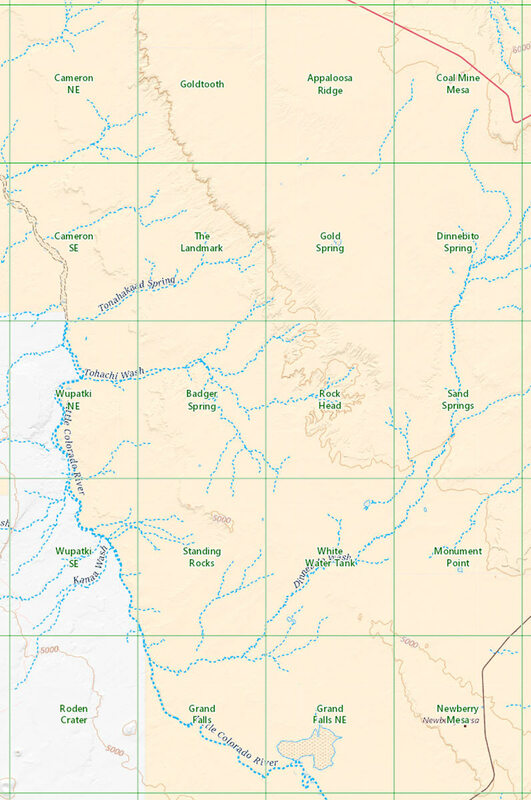 They may deny access even if you have a valid Navajo Nation permit. The directions given below should minimize contact with locals. 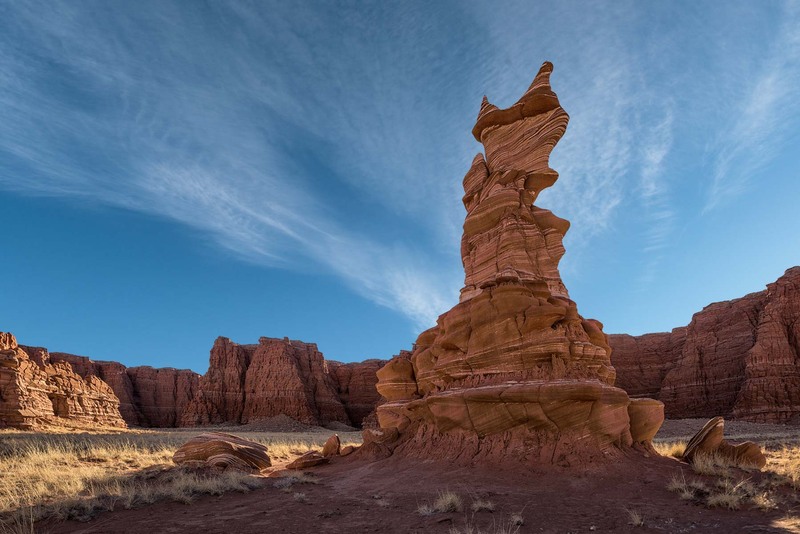 The rock formation known as The Hopi Clown is also in the Adeii Eichii Cliffs area. Even though a permit is available for the area reportedly the local leaseholder does not want visitors so I no longer include travel directions to The Hopi Clown on this site. If you do manage to get to The Hopi Clown here are some shooting recommendations. The best side of the Hopi Clown faces the northeast. Sunrise shots should work reasonably well starting in late March. Sunset shots might work around the summer solstice. In view of the long and difficult drive to the Adeii Eichii trailhead I suggest you car camp at the trailhead. Alternatively the Cameron Trading Post has a good restaurant, room rates are reasonable, and the wifi works! Tuba City also has good lodging. The Adeii Eichii Cliffs area is at 4,500 feet elevation, about 300 feet higher than Cameron, AZ. Due to the elevation difference Adeii Eichii's climate should be about 1-2° F colder than Cameron's. Historical temperature and rainfall data for Cameron can be found by clicking here. Unlike many locations in Arizona winters are reasonably mild with averages highs in January about 50° F. Summers are hot with average highs around 100°F and should be avoided. 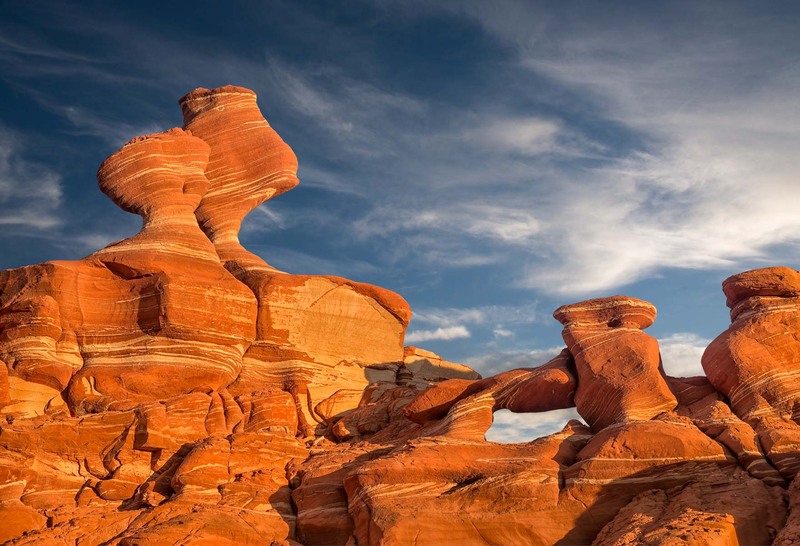 Cameron and Tuba City are in a very windy area of Arizona so March to May should generally be avoided though there will certainly be days with low winds. Fall is probably the best time to visit. The Adeii Eichii Cliffs trailhead is about 15.4 miles from Highway 89 via a four wheel drive road. The road is sandy and hard to follow in places so I recommend you download the KML file attached below and drive the road with your GPS on and tracking. The road crosses several washes and is impassable when wet. It takes about 75 minutes to drive the road. The drive begins near Cameron. Coming from Cameron or the south turn right (east) 0.4 miles north of the bridge over the little Colorado River. After 0.1 miles turn left. After another .3 miles bear right at the fork. Continue on the sandy road 6.4 miles to a "T" intersection. Update 2015 - this road has been blocked off by locals and unless you are in an ATV you will not be able to access the Adeii Eichii Cliffs via this route. At the T turn right (southeast) onto an unmarked road. You need to follow this road about 8.5 miles to the trailhead. The road is more of a track than a road and there will be places where it will disappear, especially near washes. Again - you should download the KML file on this site and follow it. The track on the file should be accurate to within ten feet. When you arrive at the trailhead park close to the cliffs so as to minimize the chance of being seen by locals. 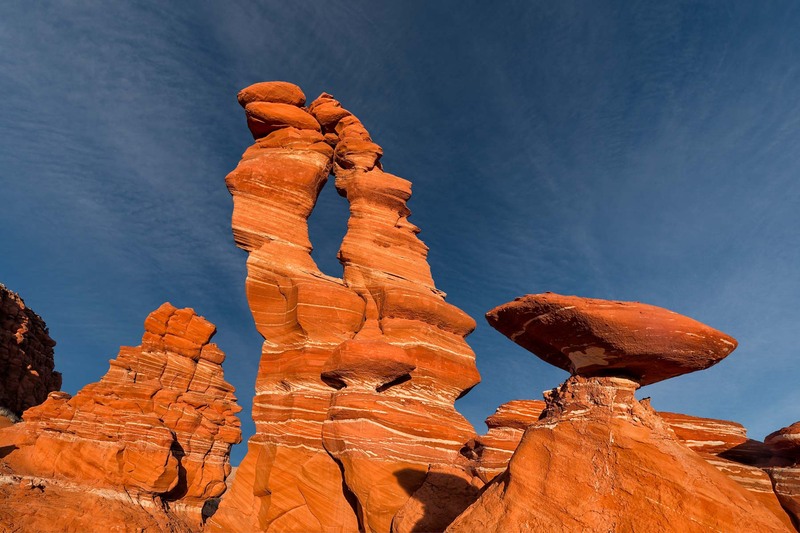 Once in the area I suggest you hike to both the "Eye of the Needle" arch and "The Ducks". Both are about two miles from parking. There are no trails but the hiking is level and easy. Keep a GPS track so you can get back to your car after dusk. The Eye of the Needle is best at dawn in the winter months, or at dusk in the summer. Update 4/15/2019 - The Eye of the Needle collapsed sometime in Winter 2019 and is no longer a good destination. The Ducks and London Bridge are still worth visiting. The Ducks area is best in the spring/summer at dusk. There are many other formations of interest in this region but I have not yet had a chance to explore them. I have been told there area also dinosaur tracks. To view the map larger please click on the box in the upper right corner of the map. The maps below contain the entire Adeii Eichii Cliffs including the Red Rock Cliffs area. The topo map "The Landmark" covers the area in the Adeii Eichii that I photographed. It also contains the hike in. The Gold Tooth map is just north of The Landmark. There are probably good photo opportunities in this region as well. Cameron NE and Cameron SE cover the drive in. The table to the right contains the topo maps in a variety of formats. KMZ overlay files can be opened with Google Earth, and Oruxmap files can be opened with oruxmaps, a free mapping app for android phones and tablets. USGS topo maps contain a white border (called the collar) which contains information such as the map name, names of neighboring maps, date the map was created, latitude and longitude reference lines, ... While collars are very useful on printed maps, the information on the collar is much less useful for computer use. Maps with the collar removed can also be downloaded in the table to the right. For reference here is an image showing the names of all 20 topo maps and their location. The topo maps can be downloaded to the right of this image.